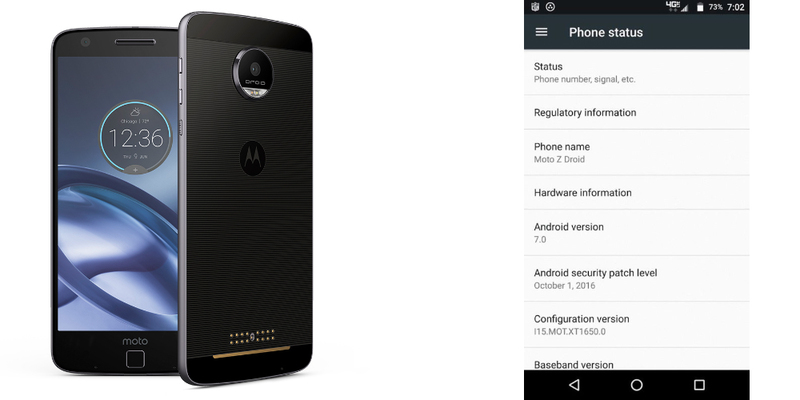 The next smartphone to receive the update to Android 7.0 Nougat could be the Moto Z. Lenovo is testing the new software for this model, a clear sign that the update is in an advanced stage of the process. The testimony of the test has come across a screenshot leaked in the last hours, and that just shows how this modular cell phone carries the latest Google operating system and the October security patch. Lenovo had promised the arrival of Android 7.0 Nougat for Moto Z before the end of the year, and today's image seems to reflect that the Chinese giant strategies are on track. A story that should not surprise us, because for the moment has already demonstrated its effectiveness in incorporating updates in record time with the latest software version on Moto G4 and Moto G4 Plus (made official a few days ago). The next step will undoubtedly incorporate the latest operating system across the Moto Z range, the acclaimed modular smartphones that are already on sale on the market (Moto Z Force, Moto Z Play). The distinctive features of the next update of the system are not yet known, but it is possible that they may be the same included in the novelties presented by Google last May: Multiple windows (ability to open and manage the window of two applications simultaneously), the improved multitasking, the new notifications panel and, above all, a further refinement of Doze, the energy saving mode opened with Android Marshmallow. If Lenovo continues to meet the expected times with respect to software, ensuring the deployment of the new version of the operating system, Moto Z, as well as the Lenovo Moto G4 and G4 Plus, it will lead the list of smartphones with Android 7.0 Nougat. A list by now quite restricted and only supported by the Nexus, Google Pixel and LG V20 devices. At the moment Google is still not able to ensure the overall continuity of Android, and brands skip versions or devices must be abandoned at some point in the process. Currently, only 1% of cell phones and tablets have Android Nougat. The situation does not improve when we talk about Android Marshmallow, which is in less than 20% of devices. However, Lenovo and Motorola are doing a good job that puts them ahead of the competition. Now we only have to wait the end of next month to check the availability of the official update.